Dominated by the 3,000 metre high Entoto mountains immediately to the north (from which one can obtain a breathtaking view of the city), Ethiopia's largest city has grown at an astonishing speed since it was founded in 1887. Covering 250 square kilometres, Addis Ababa rambles pleasantly across many wooded hillsides and gullies cut through with fast-flowing streams. Despite its proximity to the Equator, the lofty altitude of the world's third-highest capital enjoys a mild, Afro-alpine climate. By the late 1950s Addis Ababa was recognised as the unofficial capital of Africa, and thus was made the headquarters of the United Nations Economic Commission for Africa (ECA) in 1958 and later, in 1963, chosen as headquarters of the Organisation of African Unity (OAU). Today Addis Ababa, which bears the imprint of many of these past developments, is a major metropolis, with an estimated population approaching 7.6 million. Located at the centre of Shewa region, the city stands at the very heart of Ethiopia and is Africa's unchallenged diplomatic capital, with more than seventy embassies and consular representatives clustered in the mountain city. For the visitor there is a range of excellent hotels and restaurants to suit all tastes and pockets. The city has a flourishing cultural life, with regular exhibitions and lectures. There are many opportunities to experience Ethiopian music, song and dance, to visit museums and to see the city sights. Traditional restaurants abound in Addis Ababa, and offer entertainment in the form of the ubiquitous masenqo, minstrels and traditional dance troupes. There are also many other specialized restaurants in the city, including Chinese, Italian, French, Indian, Armenian, Arabic and Greek. There is much to do and see in the capital, by day or at night when the variety of nightclubs offers all manner of music and dancing-from Ethiopian to modern pop. The sport-minded can take advantage of the tennis courts and gymnasia-as well as open-air swimming in warm thermal water-offered by several top quality hotels. In addition, Addis Ababa stadium offers frequent inter-African and other international and local football matches; and there are opportunities for horse ridding, bowls, and other sports. In the famous 'Mercato'- the largest open-air market in Africa between Cairo and Johannesburg-one can find a bewildering selection of grain, spices, clothes, ironware, pots and pans, and curios for the tourist market. It is a colourful and vibrant place in which hard bargaining is the order of the day. After the bustle of the Mercato, the city's second main shopping area, Piazza, provides a calmer environment and, in many cases, better quality goods. As its name suggests, Piazza has an Italian flavour. Sprawling out along Adwa Avenue, it is an area of gold and silver smiths, cake shops filled with delicious pastries, coffee bars, shoe shops, tailors, and video libraries and electronics retailers. A short distance form Piazza lies the long thoroughfare of Churchill Avenue where a vide variety of shops specialise in Ethiopian handicrafts and other curios and souvenirs of interest to the tourist. The discoveries of the remains have given rise to the theory that Ethiopia is the 'Cradle of Humankind'. Also many historical artefacts, ancient coins and paintings are displayed. The newer Addis Ababa Museum, opened in 1986, focuses on the political, cultural and architectural history of the capital. Addis Ababa's Railway Station, dating back to 1929, houses the late Haile Selassie's Imperial Train, which consist of four coaches. Two, based on the American style, were built by Franco-Belgique in 1930, while the other two, base on the French style, were built in 1954. The interiors of the 1930 stock are still in excellent condition, the mahogany panelling inlaid with ebony grips and brass fittings. The imperial sleeping carriage, with two bedrooms with single brass beds, is enclosed by a small bathroom at one end and saloon with eight red leather easy chairs at the other. The matching coach has a large saloon with fold-away tables, which can accommodate sixteen people, plus a large kitchen and a restroom. The two newer coaches have a similar layout inside, but the exteriors are of aluminium. Small groups may see the Imperial Train with permission from the general manager of the railway company. A rail service operates daily between Addis Ababa and Dire Dawa, leaving the capital at 7:30 am and arriving at Dire Dawa about fourteen hours later. From there a train leaves Dire Dawa every other day at 5:30 am reaching the port of Djibouti seven hours later. Trains running in the opposite direction follow the same timetable. Located in the geographic centre of Ethiopia, Addis Ababa is ideally situated for excursions to all parts of this remarkable and beautiful country. Excellent roads, and efficient internal air connections provided by Ethiopian Airlines, mean that it is possible for even the short stay visitor to see at leas some of the main places of interest. South- east of Addis Ababa, a good road leads to some of the loveliest scenery and places in all of Ethiopia- in that dramatic natural phenomenon, the Great Rift Valley. You will past first through the capital's industrial sector south of the city where you can pause to stroll through an unlikely Eden for such a location-the Bihere Tsige tropical gardens, which boast more than 6,000 different varieties of endemic and exotic flora planted over several hectares. From the journey continues through villages and farmlands dotted with tukuls and after an hour you arrive at Debre Zeith (Bishoftu) a busy commercial centre. From there you go towards the Awash river to the sprawling Wonji sugar estate into the pleasant, bustling town of Nazareth. From there it is not too long a drive-23 kilometres to Sodere, a favourite weekend resort. Another excursion from Addis Ababa leads out to Wuchacha, Addis Alem to Ambo and then a swim in the hot pool before returning in the late afternoon to Addis Ababa. You can travel northwards out of Addis Ababa to Debra Libanos and the Blue Nile Gorge. You can enjoy a picnic lunch at the river on the other side before returning to Addis early in the evening. 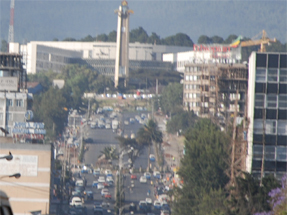 Addis Ababa is a major African hub. The International Bole Airport is a constant hive of activity as traveller head to and from all part of Africa, the Middle East, Europe, the Indian sub-continent, and further afield. Closer to home, Addis is an excellent base from which to explore Ethiopia, via an excellent networking of local flights, or to visit some of the nearby attractions by road.